Looking at the icons, many people do not think about the fact that from time to time they need to clear. In the Church, being watched by the servants of the house, and how to do it right at home? Features care icons directly depend on how and when they were made of what material. Try to approach the issue consciously and seriously, it has collected the necessary information. Any event with icons is done slowly, carefully, to cleanse you must use a soft cloth, wet wipes, cotton buds. If the icon is under glass, then clean it from dust and small dirt is not difficult. We need only wipe the surface with a damp cloth, then dry. However, if the handwriting icon, then there will have to show skill, it is important not to use solvents or products in the composition of which is acetone. To clean and store the drawn image of the Holy can only be experienced restorer. The fact that it is very important not so much the process of getting rid of the icon from dirt and dust as an attempt to return to her former appearance, not damaging its protective top layer, which almost certainly consists of linseed oil. The most difficult to clear those icons, which are made of gold, silver, copper, and have a carved texture. In this case it is important to use only special funds, which are intended for cleansing jewelry or precious metals. In some cases, use tooth powder or paste Goy, as well as other abrasives, but they should be extremely cautious, because they, along with the dirt and destroy the icon itself. Best of all, if you resort to gentle means, for example, to a solution of baby soap. Soak a cotton swab so that the liquid is slightly absorbed, but not dripping then on the icon. Then dry the treated area, which 3-4 times and Pat the area dry with a cotton swab. The icons painted on the walls of the Church, cleaned by the most experienced restorer. They cannot be wiped clean, especially to scrape off the dirt, wax. Only the experienced hand of the master in the presence of special tools will be able to save the icon from destruction and damage. Often have to clear the image from the wax dried, it is done with a scalpel. The restorer removes the top layer and then clean with alcohol wipes lower. Before you start cleansing the main image of the icon, first try to walk with a cotton swab or a stick at the edge, then move to the center. 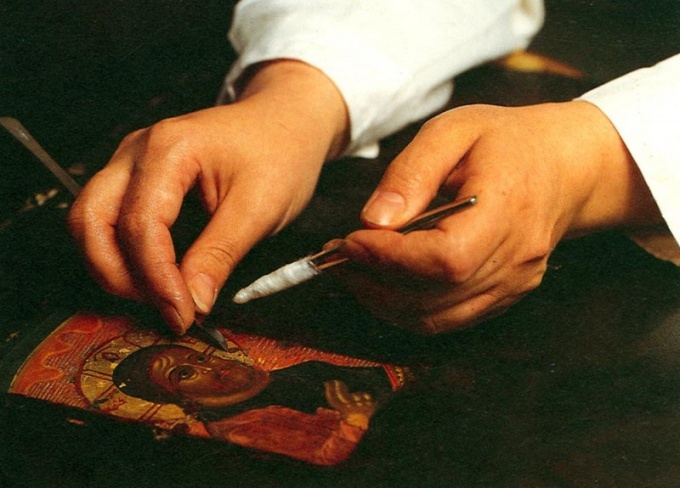 If you can see a very old icon, painted several centuries ago, covered with a layer of varnish, you should use tools which are composed of surfactants. They are carefully purified and does not contain abrasives.